Two weeks ago, the new map rotation was released which removed Braxis Holdout, added Alterac Pass and Garden of Terror. This means the map pool for this season is Alterac Pass, Battlefield of Eternity, Cursed Hollow, Dragon Shire, Garden of Terror, Infernal Shrines, Sky Temple, Tomb of the Spider queen, Towers of Doom and Volskaya Foundry. With the two new maps, especially with Garden of Terror, we have 2 Maps not seen in HGC, heads up Alterac Pass is at least in the Rotation for Ranked play. The most practice and experience will be gathered in scrims. Let us break down the maps shortly starting with Alterac Pass. DonTroopa from Portrait Goblins: I love that Alterac Pass and Garden of Terror are finally added to the map pool. Sadly thou it is not the old GoT map where a Viking strategy would have been supreme. I guess it's still a viable pick but now you don't get to control the plant anymore, which I’m personally sad about. But the fact that Braxis got removed from the pool is far better. Overall these changes will probably shake up a teams strategies and map draft a bit more and gives a new fresh wind to the Lounge itself. Alterac Pass is a usual 3 lane map with its Objective being 2 cages, both top or bottom, which need to be channeled and defended. After completing the channel, a rider, who gives allied Heroes damage bonus, will run down all lanes for the winning team. During the objectives there is not much to do except for camps. But there are only 4 camps on the very top and bottom is one Ice Giant Boss. And close to the middle lanes fort is also an armored Gnolls Camp, which are very strong, therefore I suggest taking them constantly. Alterac got a unique core mechanic also as the core got 40 Armor as soon as a keep goes down and for every keep down this Armor will be reduced by 20. It is also good to mention that the core regenerates health over time by itself when it is out of combat. To round off Alterac I asked some players on their opinion. Deathknight from Memeldors Meme Mashines: Alterac is an interesting map with the objective and the slowfields. Globals and Heroes who can easily do the camp seem very good on this map. Will be interesting to see what kind of compositions the teams will play on this map. Combustible Lemon from Triggered by Salad: Alterac is fun, just boss maps being top and bot kind of makes it 50/50 when trying to figure it out where they are doing boss. TheAmazingFelix from Jormungandr Gold: The map does have some unique aspects. The core for example is a lot harder to take down than on “regular” maps when you have only destroyed one keep. This results in a lot of prolonged games where teams have to go for a second keep or the objective in situations where they would usually be able to end. The other unique thing are the catapult replacements. They are very tanky and even having only one every third wave can create giant minion waves that will threaten your keep. Which is why destroying forts gives way too much map control in my opinion. I do think the map objective is fine, however. Gougin from Jormungandr Gold: I don’t like this map personally and it will be like another sky temple for me. 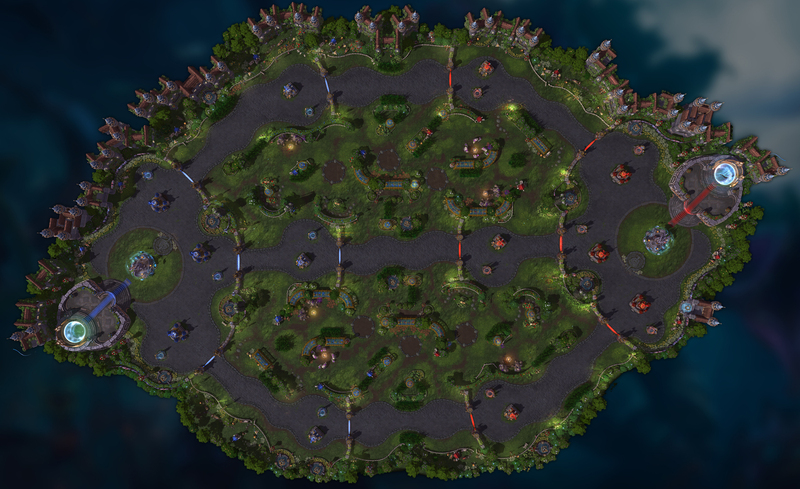 A big map where you can kinda cheese, with 1 camp on both sides that push midlane. The bosses usually just get traded, and don’t do to much in my opinion. But I have to say that taking forts on this map is really strong, since the "super minions" that get spawned every 3 waves are really strong and tank and create a big slow push that can kinda take a keep. Let us continue with Garden of Terror, a map you currently can only play in custom, quick match an unranked draft. After the rework of the map, which was released in September 2018, many people complaint about it, because it looks like a mixture of Cursed Hollow and Tomb of the Spider queen. You need to collect 3 seeds, which are defended by shambler defenders, and a Garden Terror, which can spawn apushes down all 3 Lanes. The first seed will spawn at 3 minutes and the after the seed is collected the next one will spawn in between 50 and 80 seconds. Now you or your opponent took the seed and it is time for mercenaries, 2 Knight camps and 4 Siege Giant camps are available, therefore I suggest heroes with good camp clear. I asked the same players about Garden of Terror and following will be their opinions. Deathknight: Garden is a hard map to judge, because the new version hasn’t been in the map pool yet. Looks like a bigger tomb of the spider queen version that is even more snowbally when you get the objective. Timing the camps will be important on this map since it’s a real big map with lots of camps. Combustible Lemon: Garden of Terror is a fairly strange map, the objective feels very strong and the plants make committing to the objective kind of hard and feels counterintuitive. TheAmazingFelix: I have only played the new garden a couple of times in quick match so I don’t know too much about how it plays. It looks really promising on paper. It has a good size, three camps on both sides and the tribute system from cursed hollow which I love.